Barrel tiled roofs can be tricky to clean, especially if there is a wind blowing. All of the angles of the tile must be sprayed equally to ensure a uniform cleaning. This home was sprayed from ‘A’ frame ladders except for a few small areas over the rear pool screen enclosure. In this video, you can see our spray man applying the detergent to the roof top. The idea is to minimize the amount of walking and time spent up on the roof tiles. All of the tiles receive a generous application of the cleaning solution. The Peerless Punch roof cleaning solution not only kills the algae down to the root. The solution will break down into a preventative, ensuring your roof stays clean as long a possible. Our process also requires no pressure washing or water blasting. Never allow high pressure to be utilized to clean your roof tiles or shingles. This will weaken the tiles integrity and blast away heat absorbing granules from shingles. The roofing materials must be cleaned with a detergent specified by the manufacturer. Peerless Roof Cleaning Cheval FL utilizes Peerless Punch cleaning solution that has been tested and approved by a major roofing manufacturer. Our company is licensed, insured and bonded. 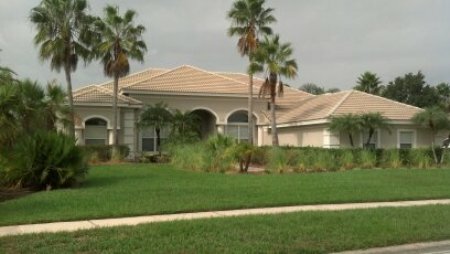 Peerless Pressure Washing Inc. is a licensed Hillsborough County Contractor #PA2902. Contact us today for a free estimate by telephone or schedule a demonstration on your roof.